In the first part of our series, we took a look at how home theater decor could be transformed by acoustic wall paneling, wall accents, and wall columns. This part will further examine the curtains, stages, and risers which will provide the backbone to your home theater and complete a full sense of cinematic ambience. With these additions, you will inspire the awestruck admiration of any guest! If one desires a true replication of every detail of the movie theater experience, then cinema curtains are a must.These curtains will frame your TV or plasma screen and provide a dramatic backdrop to any evening's entertainment, no matter what's playing. 4seating offers these curtains in three different styles: standard, deluxe, and contemporary. Each curtain consists of a valence with two side trim curtains and two further accent curtains, and can be individually customized from a wide selection of colors and two fine materials (fabric and suede). Curtains can also be custom-tailored to the size of your screen. Each of the three styles is distinct, and you can get a sense of their differences by visiting our theater curtain page. 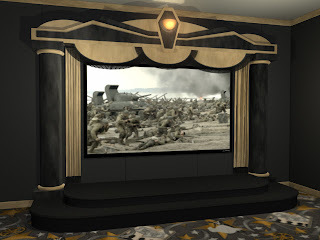 There's no better way to enhance the sense of excitement and thrill of a night out at the movies, than by having a set of curtains open up to display the main feature. If you're looking to include several rows of seats in your home theater, then you will need theater risers to make sure and provide a clear view for those in the back rows. 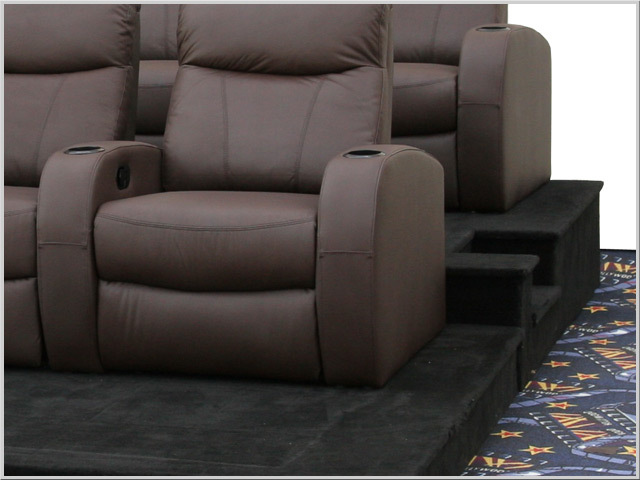 4seating manufactures the most durable and attractive risers on the market, crafted out of hardwood and covered in rich black carpeting on the sides and top. These 7" high front risers and 14" high back risers are easy to install and will ensure enjoyment from everyone in the room. For the 14" risers, an optional riser step is also available for safe, easy access. As with all theater decor accessories, these risers come in pre-built sizes but can also be custom-tailored to your required size. With the addition of these risers, you can add additional rows to your home theater and be able to entertain a party of guests! Finally, 4seating offers numerous full theater stage packages that come complete with curtains. 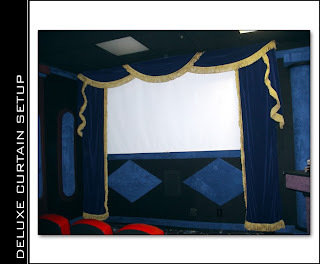 These stages serve the dual function of providing a spectacular and authentic movie theater look for your screen, while at the same time discreetly hiding audio speakers so that they are heard and not seen. The overall presentation will stun and delight friends and family. Choose from eight distinct and equally epic styles, according to your taste. The stage itself can be utilized for more than a simple accent for your TV screen--children's plays, karaoke nights, and more can all be held on its durable, handsome floors. As usual, each package is available in a variety of materials and colors and can be custom-built to your specification. With the addition of a stage, curtains, and risers to your theater, you will be transported right out of your home and back to the days when entertainment was a special, memorable experience to be cherished with others.